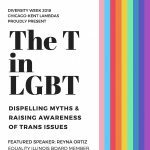 The Chicago-Kent Lambdas is an organization that provides support to students who are gay, lesbian, bisexual, transgender, and queer. The organization welcomes all students interested in areas of law that affect the LGBTQ community. The Lambdas sponsor speakers, events and panel discussions on legal issues that affect queer and trans communities. 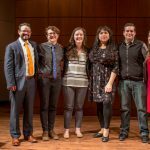 The Lambdas also represents LGBTQ student interests with Chicago-Kent administration in advocating for institutional support and change. 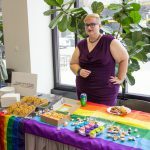 Additionally, the Lambdas provide a forum for social and professional interaction by hosting social events for Chicago-Kent students and by actively maintaining links with other queer law student associations at other Chicago law schools, as well as LAGBAC (The Lesbian and Gay Bar Association of Chicago). Please email cklambdas@kentlaw.iit.edu with any questions or concerns. 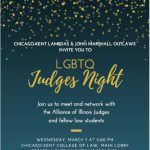 The Chicago-Kent Lambdas and the John Marshall Outlaws invite you to the 2018 LGBTQ Judges night! Join us to meet and network with the Alliance of Illinois Judges and fellow law students.